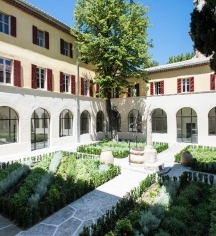 The Hôtel & Spa Jules César Arles – MGallery by Sofitel was once a Carmelite convent founded in 1661. Some three centuries later, several enterprising hoteliers has transformed the entire complex into a luxurious boutique hotel. It quickly developed a prestigious reputation. But by the early 2000s, time had taken its toll on the historical structure. Sofitel soon acquired the building, which it determined to save through an ambitious series of renovations. Renowned designer Christian Lacroix oversaw the project, who managed to brilliantly combine elements of the location’s stunning 17th-century character with contemporary artistic flair. 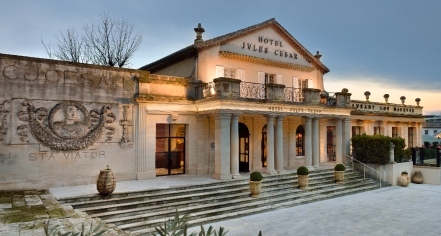 When the renovations concluded in 2014, the Hôtel & Spa Jules César Arles stood as one of southern France’s most esteemed holiday destinations. The site is a hotel of character that combines elements of the 17th century with contemporary art, bringing the hotel to the present while not forgetting its past. The hotel offers 52 uniquely decorated rooms, 11 of which are suites designed to embody one of three personalities, Lacroix, Provençal, or Monastic. The hotel also features a range of other amenities, including an outside pool and a fitness room. When hungry, guests will find that the Lou Marqués restaurant is an excellent option for fine dining, while the Bar Le Jules is the perfect option for relaxing with friends for an evening drink. Tired travelers and city explorers will also relish the opportunity to rejuvenate at the spa, which offers a variety of ancient treatments to send guests away feeling refreshed. The Hôtel & Spa Jules César Arles – MGallery by Sofitel possesses five meeting venues that convey an alluring, tranquil ambiance, which is perfect for hosting friends and family alike. Famous attractions abound, from the Arles Amphitheater to the Alyschamps, many of them a part of the city’s UNESCO World Heritage Site. With the hotel located right in the heart of the city of Arles, guests will be able to easily explore the area history and culture. Hôtel & Spa Jules César Arles – MGallery by Sofitel, a member of Historic Hotels Worldwide since 2018, dates back to 1661. Cancellation Policy: Cancellations must be made 6 p.m. on the date of arrival. Deposit: Prepayment or a credit card guarantee is required. Hotel/Resort Fees & Taxes: There is a city tax of €3.30 per person, per day. Occupancy Restrictions: Rooms have space for up to four (4) people. Parking: On-site valet-parking is available for €20 per car, per day. Pet Policy: €15 per pet, per day. The Hôtel & Spa Jules César Arles – MGallery by Sofitel was once a Carmelite convent founded in 1661. Some three centuries later, several enterprising hoteliers has transformed the entire complex into a luxurious boutique hotel. It quickly developed a prestigious reputation. Learn more about the History of Hôtel & Spa Jules César Arles – MGallery by Sofitel .